The Canadian dollar fell heavily Wednesday to close below 89 cents US for the first time since mid-2009 as markets interpreted comments by the chair of the Federal Reserve to mean the U.S. central bank could raise interest rates sooner than thought. The loonie tumbled 0.86 of a cent to 88.93 cents US as the Fed reaffirmed its plan to keep short-term rates low, near zero, to help support the economy, but it no longer mentions a specific unemployment rate that might lead it eventually to raise short-term interest rates. Instead, the U.S. central bank says it will monitor “a wide range of information” on the job market, inflation, and the economy, before approving any rate increase. 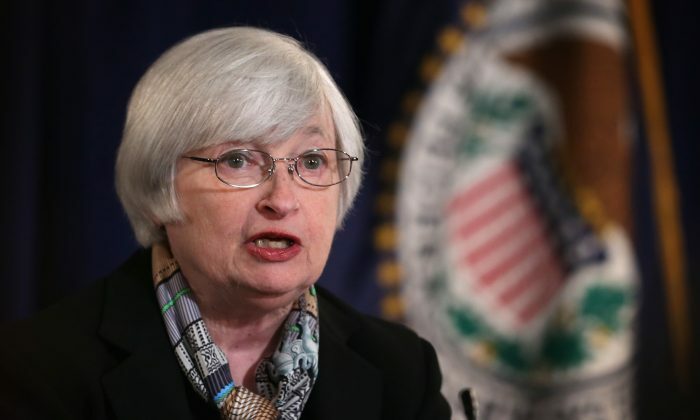 The Fed downplayed the importance of the unemployment rate as a sign of the economy’s health. Fed officials ended their two-day meeting having eliminated a previous commitment to consider raising short-term interest rates once the unemployment rate fell below 6.5 percent. The unemployment rate is currently 6.7 percent. One reason for dropping a threshold unemployment rate, as Yellen among others have noted, is that the rate can overstate the job market’s health. In recent months, for example, the unemployment rate has fallen not so much because of robust hiring but because many people without a job have stopped looking for one. Once people stop looking for a job, they’re no longer counted as unemployed, and the rate can fall as a result. Later, Fed chair Janet Yellen signalled that the central bank could begin raising short-term rates six months after it halts its bond purchases around year’s end. That was the clearest indication to date of when the Fed might raise its benchmark short-term rate, which has been at a record low near zero since 2008. The Fed has previously resisted specifying the timing of a possible increase in the short-term rate. The Fed is also further cutting its monthly long-term bond purchases—a key piece of economic stimulus that has kept long-term rates low and encouraged significant gains on stock markets—by another US$10 billion to $55 billion. It said it is doing so because it believes the economy is strong enough to support further improvements in the job market. Speculation about Fed intentions came a day after the governor of the Bank of Canada indicated that interest rate hikes in Canada could be further away than thought. The currency tumbled 0.68 of a cent on Tuesday after Stephen Poloz said that slower than normal growth may be the new norm. And he said those conditions will require central bankers to keep interest rates low for longer than they would have in the past. And, he added that a rate cut by the Bank of Canada could not be ruled out. “In the past week, we had Poloz hinting that inflation is still too low and not being particularly sure that the next move will be a rate hike but rather could still be a cut,” said Avery Shenfeld, chief economist at CIBC World Markets. Meanwhile, an economic forecast released by Royal Bank says the loonie will trade at about 87 cents US by the end of this year and dip to 85 cents by the end of 2015. RBC is also predicting that economic growth should hit 2.5 percent this year, despite a weak start to 2014 caused by severe winter weather, with growth picking up to 2.7 percent in 2015. That’s slightly stronger than the Bank of Canada’s call for 2.5 percent growth in both years.